The “Italian tone” is one of the most mentioned aspects in the world of stringed instruments. The sound of the best violins, violas and cellos created in Italy in the XVII and XVIII centuries is by far ranked the best one achieved in history. Their sound is – as most people call it – “warm”, “full of harmonics” or just simply “amazing, inspiring, beautiful, sublime”. It is also the subject of many legends, all pointing to a few individuals who achieved “miracles” with wood and varnish; we can conclude that today, after hundreds of years, we still have to learn many things from our predecessors. A very few families of craftsmen and their apprentices built those instruments: the Amatis, Stradivaris, Guarneris, Ruggieris, Bergonzis, the Gaglianos, and other makers like Goffriller, Montagnana, Guadagnini… Historical proof of professional and personal links between most of them is undoubted. Maybe there were close connections between all of them but maybe historical data has been lost. It would not be hazardous to consider that the core of the “Golden Age of Violinmaking” as we call it today was a priceless bag of knowledge, a legacy, shared between relatives in the family business or with competent apprentices. Since their dramatic decline in the XIX century, caused by wars, poverty and political chaos, many later talented makers tried to obtain similar acoustical results as their ancestors, but their best efforts were every time insufficient. The chain was broken, and it remained a lost, great art. Even today, using all the high-tech equipment, scientists cannot duplicate the fabulous sound these 300 years-old instruments produce. As a student violinist in my youth, I also had my thoughts and curiosities about why these violins sound so remarcable. Heaving the possibility to play a few times on some authentic masterpieces, notably a few Stradivaris and a Pietro Guarneri, I started doing some simple research, witch got more and more complex as I began to be seriously involved in learning violin making. I was very lucky to meet two very important people in the field, Markus Barbarossa and Roberto Regazzi, both distinguished violin makers and connosseurs. They introduced me to this craft, made me fell irremediably in love with it and so helped me decide on my future, in choosing the making of musical instruments as a career. Separating facts from fiction and heaving endless discussions about acoustics helped me reach a deeper understanding of how a violin produces sound. Most of us heard legends about varnish, secret wood treatments and miraculous substances…the real acoustical differences of those instruments and the rest is to be found elsewhere. Maestro Roberto Regazzi, notable descendant of the Bolognese school of violin making, one of the oldest traditional schools still surviving in Italy, shared with me essential knowledge about an ancient approach of construction in relationship to sound quality, helping me to understand an elegant yet intriguing acoustical system that was invented in Cremona in the XVI century, flourished in the XVII and XVIII centuries and almost vanished with the few who knew it’s essential principles. The Bolognese school somehow still uses this very old approach. Either through re-discovery or by heaving still very old threads to the past – I cannot tell… in any case, the instruments of Fiorini, Pollastri, Poggi, Regazzi, Guicciardi and other bolognese masters are some of the most sought-after modern instruments today. And thanks primarily to their excellent tone, although the truly great visual mastery is undeniable. I was completely convinced of this wonderful system when I checked for it myself on great old instruments. The presence of the typical “signs” were clearly there. All pupils of Amati (of course including Stradivari), the Guarneris, Gagliano, Grancino…Everybody used it! Virtually all great italian instruments that I personally analysed had this acoustical system incorporated. The healthier and undisturbed the instrument was, the better the sound was produced by the respective instrument. We know that some later violin makers had a horrible custom in thinning the plates of instruments. Or, some complicated accidents had an impact on their sound. This system is so delicate that even a few patches or added wood for repairs can alter its function. Unquestionably, the delicacy and complex equilibrium of these “signposts” made them virtually impossible to create by luck, only keen awareness, great attention and fine work could make them exist the way they do. Building my very first violin as a student with a few of these principles incorporated as good as I could at that time produced a result that surprised me, and everybody else that heard or played the instrument -fellow musicians, teachers, even important solists and much more experienced violin makers. Today I am mostly making new instruments to notable musicians who already own one made by a legendary maker from Italy. The trust and approval of distinguished artists is the best proof I can have that I am pursuing the right direction, offering them a pertinent alternative to their great old instruments. Since my first instrument I am relying solely on this wonderful acoustical system, a self-generating marvel, that simply guides you through the carving process with the particular piece of wood you are using. Every single time the system looks slightly different – unique to every particular wood density, form or arch I incorporate. Maybe this characteristic is making this system being so elusive to so many makers today and in the past, it’s “volatility” and lack of a standard structure. 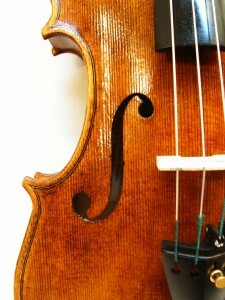 This uniqueness of shape and thickness is a typical characteristic of any “golden age” Italian instrument, that is why exact copies of them never sound the same, not even close, no matter the effort. That is why two Stradivaris (for example) are never the same in their construction. Nobody ever discovered a general rule in thicknessing plates, or creating archings, etc. It is all about understanding the wood before the insturment is assembled. Each plate has it’s “signs” and “tools” that a violinmaker should use to make it resonate as good as it can. The possibilities are endless, so is the road to perfection. Clearly Stradivari and Guarneri were the most gifted “path walkers”. Recognizing similar acoustical principles on their violins, the same “tools” and “signposts” in their work are indispensable guidelines in my own work.